Kyiv Society for the Preservation of Ancient and Artistic Monuments [Київське товариство охорони пам’яток старовини і мистецтва; Kyivske tovarystvo okhorony pamiatok starovyny i mystetstva]. An association of historians, archeologists, and art scholars formed for the purpose of finding, preserving, studying, and recording the monuments of Ukrainian antiquity and art in 1910 in Kyiv on the initiative of Mykola Biliashivsky and Vikentii Khvoika. Its members were active in Kyiv gubernia, Podilia gubernia, Volhynia gubernia, Chernihiv gubernia, Poltava gubernia, Katerynoslav gubernia, and Hrodna gubernia and Bessarabia province. 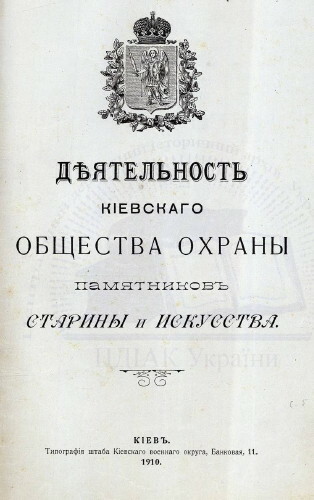 Such prominent scholars as Mytrofan Dovnar-Zapolsky, Mykola I. Petrov, Vladimir Ikonnikov, Volodymyr Shcherbyna, and Vasyl Zavitnevych belonged to the society. In 1913 a branch was founded in Uman. The society was dissolved in 1919 upon the creation of the All-Ukrainian Committee for the Preservation of Ancient and Artistic Monuments.